Christmas is just around the corner which means party season has arrived! Read on to discover which of our party shoes is best suited to your feet so you can celebrate in comfort as well as style. Whether you’ve got a swollen instep, sensitive feet or problem toes, we’ve got a dressy shoe to meet your need. This pretty style is cut lower so it’s ideal if you swell across the top of your foot and down to your toes. Soft, lightweight and supportive, it has a touch-fastening strap that adjusts to fit a range of swelling. Ideal for sensitive feet and toes, this soft, slipper-shoe will add a touch of glamour to any outfit. It’s supportive around the heel and cushioned underfoot for extra comfort. This stylish, heeled court shoe is gently elasticised so it’s ideal if you swell across the top of your foot. 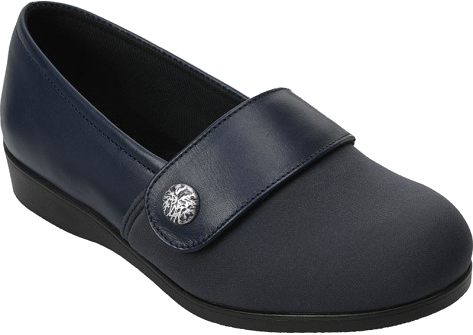 It combines an elegant look with outstanding comfort thanks to the soft, cushioned footbed. Even if you haven’t worn a heel for a while, you’ll find that Hettie feels stable and supportive. It’s cushioned underfoot and has a super-soft lining, so you’ll find it comfy to wear all day. The front part of this dressy shoe is made from Elastane which stretches to fit awkward-shaped feet and won’t put pressure on swollen, sore or sensitive toes. It’s also seam-free in the toe area for added comfort.